One of the worst days in America’s history saw some of the bravest acts in Americans’ history. 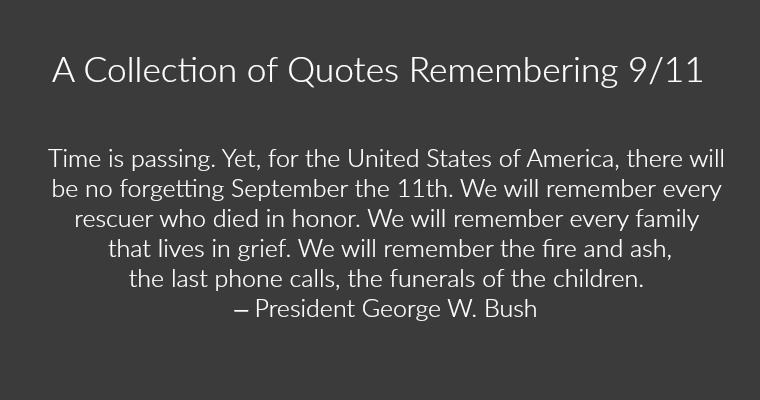 We’ll always honor the heroes of 9/11. And here at this hallowed place, we pledge that we will never forget their sacrifice. With almost no time to decide, [your loved ones] gave the entire country an incalculable gift. They saved the Capitol from attack. They saved God knows how many lives. They saved the terrorists from claiming the symbolic victory of smashing the center of American government. … They allowed us to survive as a country that could fight terror and still maintain liberty and still welcome people from all over the world from every religion and race and culture as long as they shared our values, because ­ordinary people given no time at all to decide did the right thing. September 11 is one of our worst days but it brought out the best in us. It unified us as a country and showed our charitable instincts and reminded us of what we stood for and stand for. If we learn nothing else from this tragedy, we learn that life is short and there is no time for hate. Five years from the date of the attack that changed our world, we’ve come back to remember the valor of those we lost—those who innocently went to work that day and the brave souls who went in after them. We have also come to be ever mindful of the courage of those who grieve for them, and the light that still lives in their hearts. Ten years have passed since a perfect blue sky morning turned into the blackest of nights. Since then we’ve lived in sunshine and in shadow, and although we can never un-see what happened here, we can also see that children who lost their parents have grown into young adults, grandchildren have been born and good works and public service have taken root to honor those we loved and lost. "Are you guys ready? Let's roll." - Flight 93 passenger Todd Beamer, apparently as a signal to other passengers to attack the hijackers. What separates us from the animals, what separates us from the chaos, is our ability to mourn people we’ve never met.